Below are examples of several active sites that express a wide range of designs by Sherry Mouser, customized to express the client’s vision. 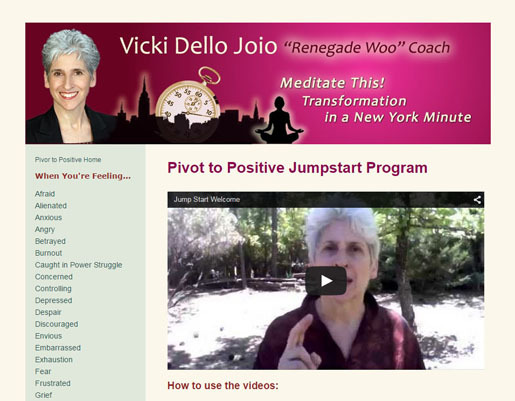 “You don’t have to sell all your belongings and move to a mountaintop to experience peace of mind” — Transformative teacher, speaker and performer Vicki Dello Joio offers “quick pivot energy tools” online with a dynamic video series to bring you back to center, no matter where you are, or what challenges you are facing. Featured are three of Vicki’s teaching videos, with production and original music by Sherry Mouser. 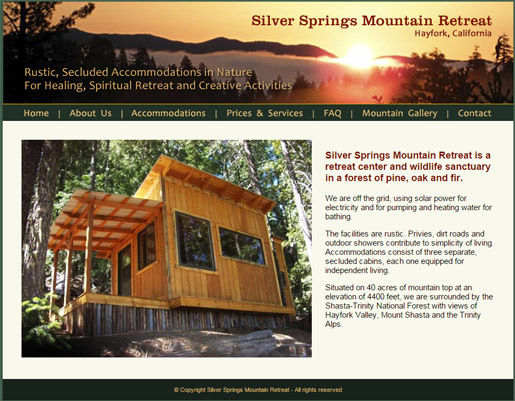 Silver Springs Mountain Retreat is a retreat center and wildlife sanctuary situated on 40 acres in a forest of pine, oak and fir surrounded by the Shasta-Trinity National Forest with views of Hayfork Valley, Mount Shasta and the Trinity Alps. They are off the grid, using solar power for electricity and for pumping and heating water for bathing. The facilities are rustic with three separate, secluded cabins, each one equipped for independent living. “To summarize my art would be like summarizing my life…which is an imaginary voyage. Our memory, or most of it, is imaginary. 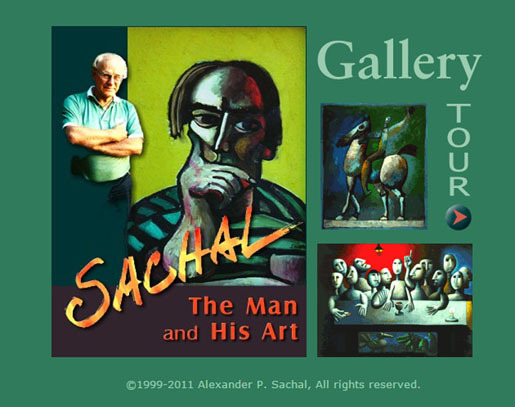 We think that we remember ‘reality’; but as time goes by, ‘reality’ is changed.” — Artist Alexander P. Sachal describes his incredible life story and reveals the inspirations for his paintings in his own words. This site is an exhibition of the rich color and fascinating imagery of his work. 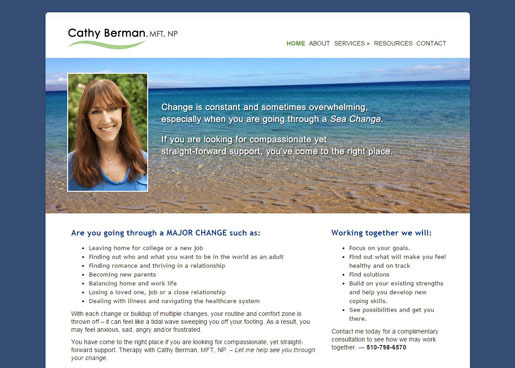 Cathy Berman is a licensed Marriage & Family Therapist with seven years experience as a psychotherapist working with teens, adults, couples and support groups. She is also a Nurse Practitioner with 25 years experience working in Women’s Health and Health Education and Research. Her concept of making a “sea change” was developed throughout the site. 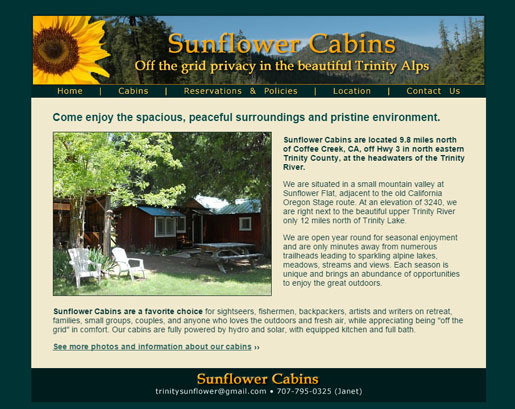 Sunflower Cabins are a favorite choice for sightseers, fishermen, backpackers, artists and writers on retreat, families, small groups, couples, and anyone who loves the outdoors and fresh air, while appreciating being “off the grid” in comfort. Located in the Trinity Alps of Northern California. the cabins are fully powered by hydro and solar, with equipped kitchen and full bath. Slide shows of photos (most taken by Sherry) provide tours of the cabins and grounds. One of Sherry’s favorite successes was as web developer for The Bar Method, working with Founder Burr Leonard for more than a decade, from 2001 with the opening of The Bar Method’s first fitness studio in the San Francisco Marina district, through 2013, during their expansion into a prominent corporate entity with more than 75 franchise studios nationwide and in Canada.